Vero Beach, FL… Martha Lemasters will be at The Vero Beach Book Center on Wednesday, April 6, 2016 at 4pm to sign copies of her recently released memoir, The Step. “It’s almost as if the Apollo Team, at least all the contractors that worked on Apollo, are the team that time has forgotten,” says first time author Martha Lemasters. Lemasters’ memoir, deals with her first-hand account of her years working for IBM at Kennedy Space Center as a PR writer on the Apollo program during the 60’s and 70’s. It is the first book written about the Apollo program from a woman’s perspective—and from the perspective of one of the contractors, not NASA. As a PR writer, Lemasters had a unique opportunity to pursue a story anywhere on the grounds of the Center, including the pad and throughout the VAB. “I started the book in the 70’s in third-person dialog. When I resumed writing the book three years ago, I quickly realized I had to do it through my own eyes, as a memoir. I had to be totally honest and bring it to life. There just wasn’t anything in the bookstores about all the hard-working, contractor employees at the Cape. The Step is also about Lemasters’ journey to finding her own success during these years. A divorced mother of three daughters, she spent years proving herself and prevailed over an entry-level job and related women’s issues in the workplace to finally realizing her dream of becoming a writer. Added to this story line is the very inspiring account of a woman gaining strength in her own sexuality and happiness. “I recently took my cousin on a NASA bus tour through Kennedy Space Center, my old stomping grounds,” Lemasters explains. “There on display was the giant Saturn V vehicle, lying on its side, separated into stages, but nowhere were the names of the contractors displayed—it was as if NASA had done everything. The lack of recognition for the contractors doesn’t change history and the fact that there were many unsung heroes, brilliant engineers, analysts and programmers, doing things that had never been done before, toiling away behind the scenes, that made this momentous, game-changing feat happen. What was it like to be a part of this history-making event of launching our astronauts to the moon? Fasten your seat belts and journey back to the 60’s through this remarkable book,The Step, for a front-row seat told by someone who experienced it all. NEW YORK—February 22, 2016–Morgan James’s new release, The Step: One Woman’s Journey to Finding her Own Happiness and Success During the Apollo Space Program by Martha Lemasters, chronicles the author’s personal experience working in the space program, and the important contribution the IBM launch support team made to the historical launches. “The Eagle has landed”… Those four words instantly bring to mind the Apollo 11 moon mission. In grade school students are taught the details of the famous moon landing. Almost every American could tell you the year American first landed a man on the moon, the names of the astronauts and the famous phrases they uttered. What often gets overlooked are the countless hours and dedication of the contractor teams who labored behind the scenes to make those historical landings happen. In The Step: One Woman’s Journey to Finding her Own Happiness and Success During the Apollo Space Program, one woman who witnessed it all tells the story that didn’t make the history books. Martha Lemasters worked as a member of the launch support team for the entire Apollo Program including Skylab and Apollo/Soyuz. In a time when women were deemed a liability by their very existence around the vehicle, this single mother overcame monumental obstacles to work in a male dominated field. In this exciting new memoir, she shares her struggles, triumphs, and determined spirit. This glimpse into the past provides readers with a comprehensive look at the team that helped make history. From engineers to analysts, secretaries to astronauts, Lemasters shows the integral part played by IBM’s launch support team. Enlightening and inspiring, The Step: One Woman’s Journey to Finding her Own Happiness and Success During the Apollo Space Program provides new perspective to these well-known events. If you would like more information about this topic, or to schedule an interview with Martha Lemasters, please call Nickcole Watkins at 516.900.5674. Martha Lemasters spent almost ten years working as a PR writer at Cape Kennedy as a member of the IBM’s team on NASA’s Apollo Program in the sixties and seventies. As a member of the launch support team, these years saw success in seven Apollo launches and six moon landings. Later, the moon landings gave way to the Skylab and Apollo/Soyuz programs with additional launches. As a single mother with three daughters, she worked her way up the ladder from secretary to a respected writer and managed to find her own happiness along the way. 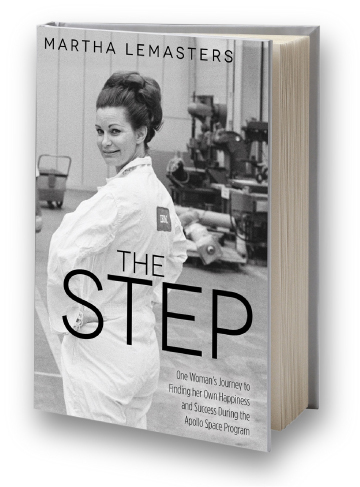 The Step: One Woman’s Journey to Finding her Own Happiness and Success During the Apollo Space Program by Martha Lemasters will be released by Morgan James Publishing on April 5, 2016. The Step—ISBN 978-1630477141—has 282 pages and is being sold as a trade paperback for $17.95. About Morgan James Publishing: Morgan James Publishing (www.MorganJamesPublishing.com) provides entrepreneurs with the vital information, inspiration, and guidance they need to be successful. Morgan James Publishing, The Entrepreneurial Publisher™, has been recognized by Publisher’s Weekly for four years on their fast growing press list and is reported as being the future of publishing.